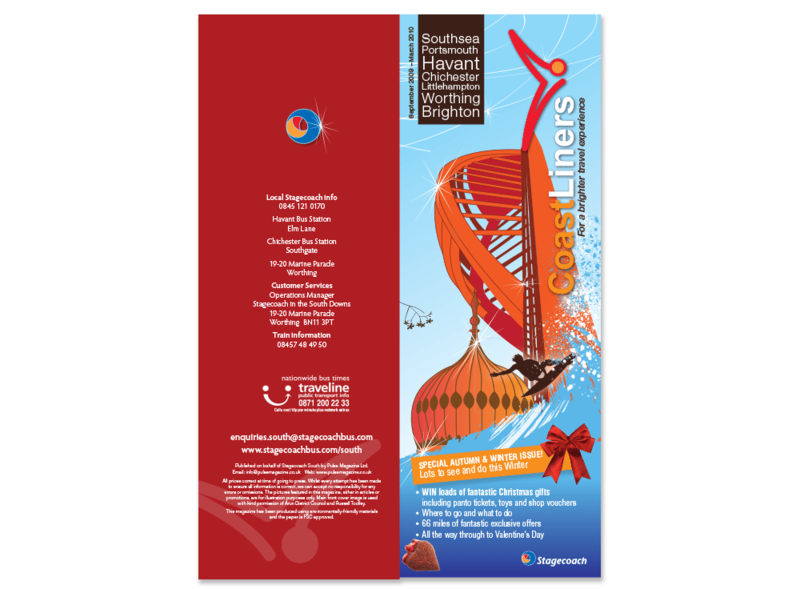 To create bus livery design for Coastliners, Stagecoach South, based on an illustration we had drawn for the front of Coastliners Magazine. Not long after the Coastliner customer magazines were printed, we received a call from Stagecoach South, who were so impressed with our illustrations, they commissioned us to illustrate four further landmarks to be used for bus livery and branding, focusing on each town that Coastliners connects. There are 40 buses in total which will be wrapped in our unique design, and there are four different designs: Worthing, Brighton, Chichester and Portsmouth. We illustrated the Spinnaker Tower in Portsmouth and The Brighton Dome, which represented the Coastliner route from end-to-end. The added benefit of this illustrated cover design. We illustrated the Spinnaker Tower in Portsmouth and The Brighton Dome, which represented the Coastliner route from end-to-end. Although the bus livery design and branding was fun, the colours were in keeping with the Stagecoach Bus corporate guidelines with orange and blue. The designs were used across Enviro 200 single deck buses and Enviro 400 double decker buses. The Enviro 400 have curved corners which was particularly tricky when curving the HMS Victory illustration round! A lesson learned for the future is to stop images before they curve around the corners onto the side, or to make them very simple. Soon after the launch for the new Coastliner 700 bus livery, we were invited to take part in the nightbus launch and we all wore our PJs for the photoshoot which you can see on the gallery on the left. Our bus livery design and branding for the Coastliner buses was proudly connecting customers to their destinations along the south coast for four years until Coastliner was once again rebranding in a much plainer, more corporate style.